Home from the bookselling trenches today and eager to share my great find. As I passed by the new release fiction bays at my store – a familiar name just leapt out at me. Margaret Drabble! Any die-hard Janeite will recall her wonderful introductions to the Penguin Classics and Signet Classics editions of Jane Austen’s novels. A renown English novelist, Drabble is also a skilled short story writer. 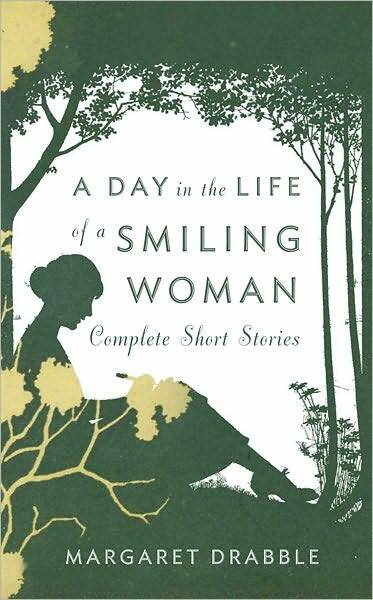 Just released today is A Day in the Life of a Smiling Woman: Complete Short Stories, a new anthology of short fiction written throughout her life and assembled together for the first time in this new collection. Margaret Drabble’s novels have illuminated the past fifty years, especially the changing lives of women, like no others. Yet her short fiction has its own unique brilliance. Her penetrating evocations of character and place, her wide-ranging curiosity, her sense of irony—all are on display here, in stories that explore marriage, female friendships, the English tourist abroad, love affairs with houses, peace demonstrations, gin and tonics, cultural TV programs; in stories that are perceptive, sharp, and funny. An introduction by the Spanish academic José Fernández places the stories in the context of her life and her novels. This collection is a wonderful recapitulation of a masterly career. I enjoy reading short stories as a brief diversion from the many novels and nonfiction books that engulf the majority of my reading time. I can’t wait to chip away at these little treasures and have already downloaded an edition to my Nook. I received a copy of A Day in the Life of a Smiling Woman from Goodreads First Reads in March. I really enjoyed her stories. It’s funny you should mention “The Dower House at Kellynch Hall: A Somerset Romance.” That was my favorite story of the lot. There is also another story in the collection that refers to Kellynch and the Elliot family entitled “Stepping Westward: A Topographical Tale,” in which an Anne Elliot makes an appearance (not the same one as seen in Persuasion, though) and takes the protagonist to Kellynch. My review went live yesterday on my blog. I hope more people give it a chance. Reading your blog, is somewhat akin to stepping into a French bakery to view the offering of the day; only the aroma is missing! Thank you for the sweet treat! I love short stories and haven’t read anything by Margaret Drabble except her excellent A Writer’s Britain. Goes on the list for summer reading. Thanks for the review. >I enjoy reading short stories as a brief diversion from the many novels and nonfiction books that engulf the majority of my reading time.